The Candle & Soapmaker's Superstore since 1998! 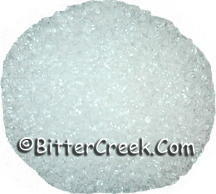 Aroma Beads are amazing little, clear plastic beads that can absorb up to 30% fragrance oil! They are perfect for use in air freshener sachets in cars, closets, drawers, luggage, vacuum cleaners, offices, near kitty litter boxes, etc! They look dazzling in sheer organza or net baggies! Set them out in a pretty glass dish as dry potpourri! They can be left clear, or colored! Make single colors, or get creative and do layers or a rainbow mix! Great for holiday theme color combos! Put them in a sunny window for an even stronger fragrance release! If you wish to color your Aroma Beads, you will need to add a small amount of liquid candle dye to your fragrance oil and swirl it around until it's mixed well. *Note: Food coloring or B&B dye will not work! Then add the beads to your colored fragrance oil. Use weight versus teaspoons. Stir the beads around with a stir stick until the liquid is dispersed evenly. Tightly put a lid on the jar and shake! It can take anywhere from 1 day to over a week for the beads to completely absorb all of the oil, it will vary with different fragrances. Keep shaking the jar every few hours! At first it will seem soupy and look as if it will not soak up the oil... but be patient! The oil will eventually soak in! If you run into a fragrance oil that is not soaking in after a week, try adding more beads and shake very well. Once the beads have absorbed all of the oil they will feel dry to the touch and will not seep or bleed! Once the oil is absorbed, you are done! Try making a second color & scent, and layering them! You can also add a bit of our White Mica Powder to the clear beads too for a shimmer, pearl effect! Each pound of beads yields about 3 1/2 cups dry beads. Voting log in to vote! These are awesome! I bought a 12 pack of half pint (8oz) waxed lid canning jars, so I could mix up some different fragrance & color combos. It couldn't have gone smoother. Each 8oz jar held a max of about 3oz of aroma beads + 25-30% fragrance. I measured my beads & fragrance oils by weight & used 25-30% fragrance load (example: for 2.5oz of beads I used 0.75oz of fragrance oil at 30%). I also swirled 1 or 2 drops of liquid candle dye in some batches, and the beads took on colors beautifully. It took 1-2 days for my beads to absorb the oil depending on the fragrance, and I found that the more you shake them, the faster they absorb. I have also made a couple of "ornies," and that went very smooth also. I used a non-stick cake pan & metal cookie cutters. After baking at 350º for 3-5 minutes, I put the pan in the freezer for about 5 minutes, and the ornies peeled off easily. The whole ornie process only took 10 minutes! Just follow the website's instructions, and you can't go wrong. A must buy - these hold fragrance well & are very strong when finished. Thank you BitterCreek for a wonderful product! Copyright All contents, graphics & page design property of BITTER CREEK CANDLE SUPPLY, INC. Copyright © 1998 – Present. All rights reserved.